I'm sure I have mentioned this before but during my last trip to Michigan my Aunt Carol gave me a bag full of old family slides. When I got back home I bought a scanner and scanned them. It was a great project and I wish I had bags and bags of old family slides to scan. 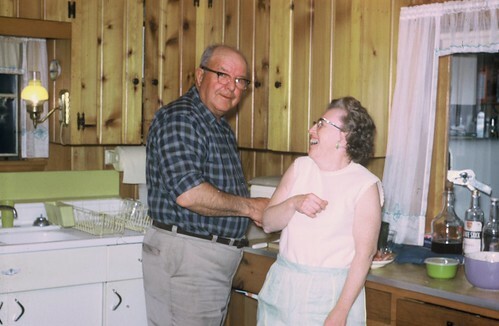 This picture is of my Dad's parents, Ed Zimmer and Mildred Zimmer. 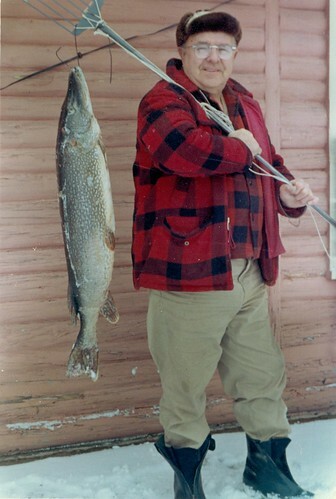 This is taken in the kitchen of their home on Clam Lake in Antrim County, MI. 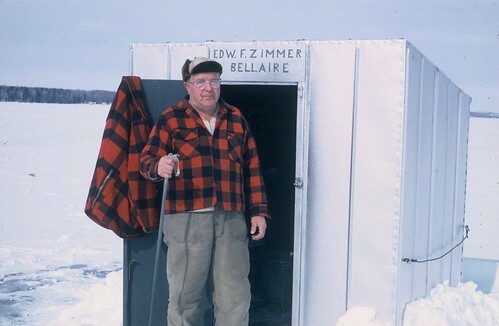 Ed Zimmer was a retired fireman and my Dad insisted I be named after him because he greatly admired the man. My Dad's real father abandoned the family and Grandpa came in when they were all teens and gave them stability. My Dad and his brothers are all in their sixties now and they still get misty eyed when they speak of him. 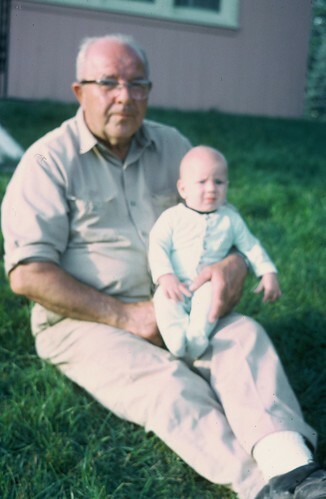 Here is a shot of Grandpa Ed holding me. This next picture was taken in the living room of the house on Clam Lake. If you look out the back window you can see snowmobile tracks all over the place. The beagle I am petting was named Penny. 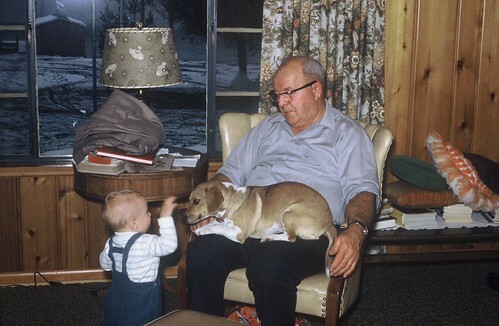 I have a distinct memory of that chair Grandpa is sitting it. I remember scratching my back on it when I had chicken pox. Of course if you retire to northern Michigan you have to own one these. You might even pull one of these babies out of the frigid water. Grand pa Ed was an amazing guy. Every time we would visit he would make time for us kids. I remember going to the orchards to get apples. He took me to a chicken farm for eggs. He polished potoskey stones with me in the garage. He read to me and laughed with me. I remember one time running the snowmobil through the dog pen and almost killing Penny and him not even getting upset... just laughed like crazy. He is the only guy I know of that had a fuel pump on the side of his house.I loved that man too. Millie always welcomed me with open arms and had a hug that would break your back.